In mathematics, to easily organize the study of numbers, it was necessary to make groups. In each group were united the numbers having the same characteristics. Throughout history, number sets have evolved, until we get to the current organization of numbers. In the diagram below you can see the currently existing number sets. We left out purposely complex numbers and other even more complicated. Hope you use this to study maths. There is a group of natural numbers, but now integrating zero. 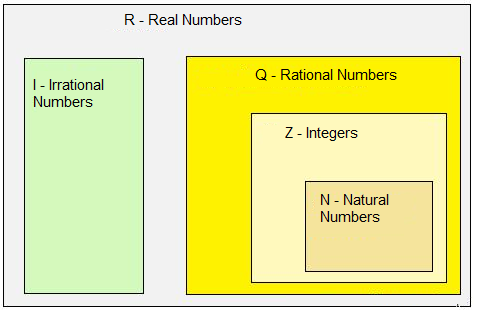 The rational numbers include the integers (example: -6) and decimal, finite (example: 2,493) and with infinite repeating decimal (example: 0.456456456 ...) The rational numbers can be represented by a fraction. This set consists of infinite decimal numbers with a non repeating decimal. As examples, we have 0,428465242 ..., or pi (3.1415926 ...). The real numbers is the set of all number sets referred aboved.